The saffron crocus (Crocus sativus) is a rare purple flower that grows in Iran, Greece, Spain, Morocco, and parts of India. 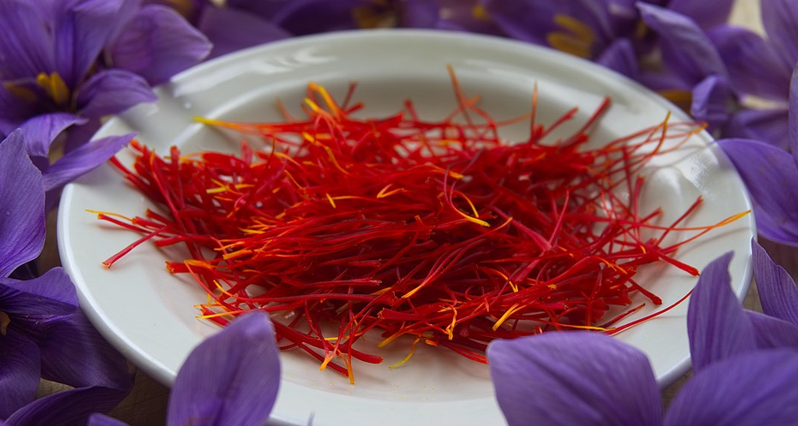 As many as 75,000 flowers – a football field’s worth of intensive cultivation – are needed to produce a single pound of saffron, which must be harvested by hand! All cultures that knew of saffron treasured it. It is the subject of Greek myth; it is honored in the Song of Solomon. Both Cleopatra and Alexander the Great bathed in it. It was coveted during the Black Plague that ravaged Europe 700 years ago; it is noted in the 3800-year old Great Herbal of China. Ancient Sumerians refused to cultivate saffron, believing its power could only come from the gods. Monks in India still dye their robes yellow with this rare spice. Today, most of us enjoy saffron for the subtle flavor and brilliant color it imparts to rice dishes, liquors, and Moroccan-style curries. Yet saffron is much more than a culinary luxury. Modern research is beginning to confirm the ancient lore of saffron’s healing properties, and expanding our knowledge into realms the ancients never even suspected. Granted, I have yet to see scientific confirmation of Cleopatra’s belief that saffron is an aphrodisiac – but I haven’t seen anything to disprove it, either. Saffron has long been esteemed for its ability to uplift mood and treat melancholy. Three recent clinical trials have tested this claim in mild to moderate depression. Not only did saffron work better than placebo, but in two of the trials, it worked every bit as well as a pharmaceutical antidepressant (with fewer side effects). One trial compared it to low-standard doze of Prozac (20 mg); another to a moderate dose of Imipramine (100 mg). Doses of saffron were 30 mg of saffron extract per day. Here, the research has all been done in animals – which means we’re still not sure what saffron will do in humans. But when animal research corroborates centuries of traditional use of a plant, it usually means something is going on. There have been quite a few studies showing that saffron prevents damage to brain cells following a stroke or chemical injury to the brain – including injury caused by alcohol. In fact, saffron was very effective at keeping alcohol from interfering with memory and learning ability in rats. In another study, saffron appeared to prevent progression towards Parkinson’s disease. In yet another study, saffron greatly reduced seizures. Bill Mitchell, who hasn’t researched saffron formally, but who has used it in his practice for more than three decades, states: “Saffron is an ideal cerebral tonic, and woefully underused.” And remember Ric Scalzo’s Date Cardamon Morning Smoothie which Debra featured in our September 2005 Newsletter? We hope you save our newsletters in a loose-leaf notebook so you can refer back! Simply, saffron appears to be one of the best protective, antioxidant substances we have for the brain. Saffron reduces platelet aggregation (blood stickiness), and can lower cholesterol. Yes. Just to be sure, you should probably avoid high doses if you’re already on strong blood-thinners, or if you’re pregnant. Otherwise, I am aware of no problems. And even if you are on the blood thinners or pregnant, that doesn’t mean you can’t enjoy an occasional serving of paella! Please note: that is 30 mg of extract, derived from 360 mg whole saffron. In all three medical journals, the short summary of the research which is made available to the public simply states that 30 mg of saffron was used. This is misleading and incorrect.